I began photographing sports professionally in 2009. Since then, the majority of the athletes I've been commissioned to cover have been males. 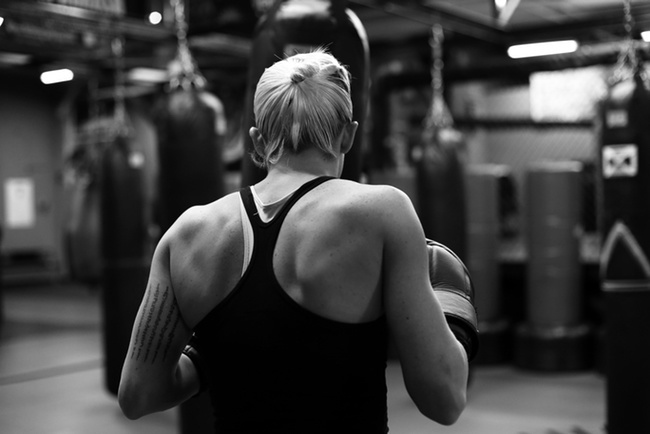 I decided earlier this year that I wanted to start photographing more women athletes, specifically in mixed martial arts. As women's MMA becomes more and more accessible, my goal is to highlight strong, successful females that are working hard to excel in this male-dominated sport. Here are the first two women I met. 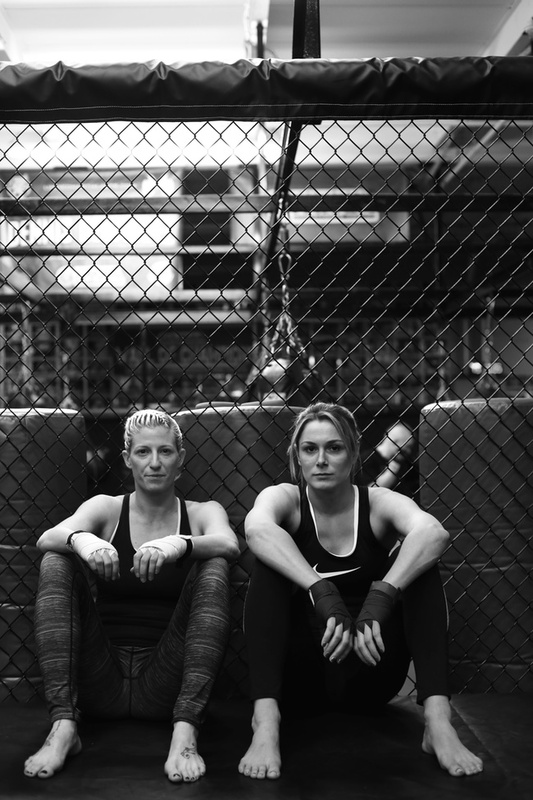 Despite being in different weight classes and being separated by almost ten years in age, Sarah Thomas and Christine Yandolli have developed a great relationship as training partners at Long Island MMA in Farmingdale, NY. I was invited to spend a night at the gym watching them train and it was clear that they share a great camaraderie as well as a positive outlook on women's MMA. Angela Datre: When and why did you start fighting? Sarah Thomas: I played sports my entire life. Soccer, basketball, track, lacrosse, and dance--I tried it all. I played rugby in college, but I just kept getting injured. I moved in with my Grandpa about two years ago to help take care of him while he was sick and I needed a sport to keep my mind off of what was going on. I decided I wanted to fight. I felt as though fighting had to be the toughest sport there is, so I needed to do it. I love challenges. I didn't ever just think I would do it to get in shape. I knew before I even knew how to throw a proper punch that there was no way I would learn to fight without actually ever fighting. Christine Yandolli: I attended a local kickboxing show on a fluke one night in 2001 and instantly fell in love with it- -the energy of the event, the crowd, and the fighters. It opened up a whole new world of martial arts that I never knew existed. I realized they didn't have any girls on the card and I wanted to be on the next card. The next day I walked into a gym and told them I wanted to fight, and I was on the next fight card. Have you had any mentors or role models along the way? Thomas: My first MMA coach, Marc Lehr, didn't even want to train me at first. He had never trained a girl before and was only interested in training fighters. But once he saw how hard I was willing to work, he decided to work with me. He believed that I had talent and gave me confidence in my abilities and how far I could take them. His job unfortunately transferred him to work in Colorado. He set me up with the trainers at Long Island MMA before he left. Anthony D'Angelo is my main trainer now and he has been so helpful. Really, every trainer here has taken time to help me and I am very happy about that. Yandolli: I have had many mentors through the years but with changing over from kickboxing to MMA, Chris Wade, Ryan LaFlare, Dennis Bermudez and Anthony D'Angelo have all been mentors for me. Their work ethic is second to none and just being in the gym training with them has completely changed me. As far as role models go, any female that steps into the cage is a role model for me. I know the training and the sacrifices that have to be made just to be able to consider stepping into the cage. Fighting is based on strong discipline, especially when it comes to training and making weight. What motivates you to do this day after day? Thomas: I like being challenged. I feel very accomplished when I am able to do something that not everyone can do. Fighting and training is so much fun for me, so it makes the challenges much easier. Yandolli: When I started fighting I did it mostly as a hobby, until a few years ago when a friend of mine was diagnosed with cancer. He started a charity for children while he was battling his own illness. I had never been so inspired by another person. I took his fight and struggles personally and ever since I dedicate my fights to him and the charity that he started. He is the reason I got back into fighting and he made me realize how much I love it. Every single day when I am training, fighting, or cutting weight, he is the reason I will never give up. Thomas: I broke my foot and needed foot surgery before my first fight. I realized that there are dangers in this sport. Trying to stay healthy is the hardest part for me. I don't handle injuries well. I have to force myself not to rush back into training. It's hard for me to take a day off. Yandolli: My biggest challenge is finding a balance between having a career and fighting. Working over forty hours a week and training can be quite challenging at times. I always want to be at my best in and out of the cage so a lot of other things tend to suffer when I am working so hard on my goals. Do you have a particular fight or moment in training that sticks out in your memory? Thomas: My foot surgery made me realize I love this sport. I was at the gym with my crutches doing abs and watching people train. I couldn't wait to get better. Yandolli: My first kickboxing world title fight is the one that I have to say sticks out the most. At that time, it was the biggest fight of my life. I remember walking to the ring and having the crowd go wild and thinking how much this meant, not only to me but to everyone that had helped me get to that point. It was a completely humbling experience that I will never forget. Thomas: I train two to three times a day six days a week. I make sure to do striking and grappling at least once a day. I do strength training two times a week. I also spar at least once a week. Yandolli: My training routine really depends on the day. I am typically in my gym two to four hours a day between strength and performance, muay thai, sparring, brazilian jiu-jitsu, wrestling, and boxing. The gym quickly becomes your second home. Describe your experience being one of only a few women in your gym. How have you two worked together? Thomas: I haven't had any bad experiences so far being the only girl. I fight at 135lbs and there are a lot of smaller guys at the gym who are always willing to work with me and help me out. I think it makes it easier for them too that I am around their size. They aren't going all out of me, but they know they can use some power without breaking me in half. Working with Chrissy has been great. She has so much experience. We also have different strengths, so we always learn from sparring with one another. We are also in different weight classes. It is comforting to know we will never have to fight each other, so our relationship is never competitive. It's good to have her as a training partner, but also someone I can talk to. Yandolli: For a while I was the only female fighter at almost every gym I was at until Sarah came to Long Island MMA. We work together on almost everything and it's amazing. 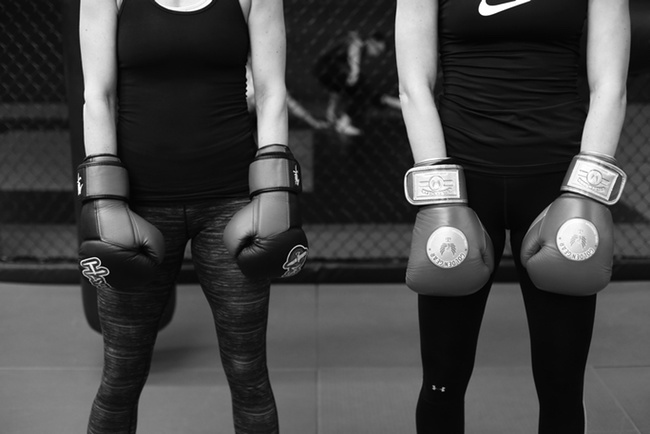 MMA is a sport of few women and usually they are spread across the country. I just find myself very lucky to have her to work with every day. 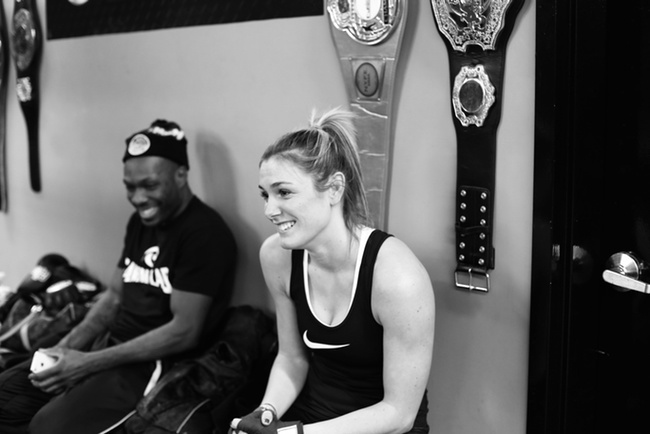 Since we have started training together, I see how much we have grown as fighters together and I'm so thankful to have Sarah to work with. What do you see for the future of women in mixed martial arts and fighting? Thomas: I think they will eventually add all of the weight classes that are in Invicta to the UFC. I also think that the talent level will increase dramatically. I think people will train with the intention of competing in MMA from a much younger age. Right now, everyone seems to have a specific strong point: wrestling, jiu-jitsu, striking, etc. I think female fighters will be more well-rounded in the future because of the opportunities for females. I hope that the future opportunities for female fighters aren't just in MMA. I would love to see some more interest in women's boxing too! Yandolli: I feel like women’s MMA is here to stay. The women have fought hard to get this far and now with two weight classes in the UFC and our very own promotion (Invicta) it’s only going to keep growing. You can see more of Angela's work on her website.